A simple cloth napkin is perfect with any meal! One great way to reduce your waste output is to use cloth napkins instead of paper towels. They are simple to make and can be used at mealtimes, packed in lunchboxes and even tossed in Mom’s purse for spill emergencies. Choose an absorbent fabric you really love or you know your kids will like and go for it! Check out the video for additional information. Wash your fabric and tumble dry it. Measure and cut out a one foot by one foot square of fabric. I like to use pinking shears, but regular scissors will work as well. Flip the fabric over and fold about a half of an inch of fabric on one side towards the center of the fabric square and crease with a hot iron. Repeat the fold one more time and crease again with a hot iron. Pin this side with several pins to hold the folded part down. Repeat steps 4 and 5 with the three remaining sides of the square. 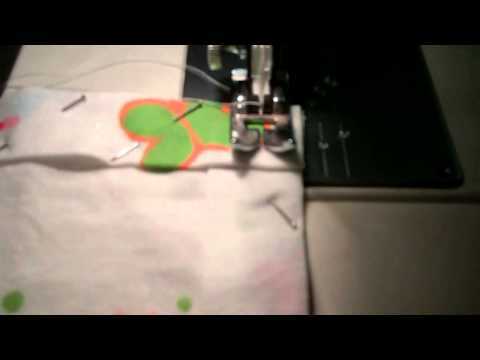 Using a sewing machine, sew a seam around each of the four sides. Trim the additional threads hanging off the napkin. Your cloth napkin is now ready for use. Enjoy! The planet approves!